Bridgestone is a Japanese company, founded by Shojiro Ishibashi on 1st March 1931. Initially the company dealt in the manufacturing and sale of tires exclusively based on Japanese known-how but now it also deals with the manufacturing and sale of tires (83%) and diversified products (17%) such as rubber and other products. The company works with 142,669 employees and has presence in 150 countries. It ranks #353 in Fortune Top 500 of 2017. Its corporate philosophy is “Serving Society with Superior Quality”. Its global brand is due to its commitment to deliver the best product, quality and technology in all its business activities. 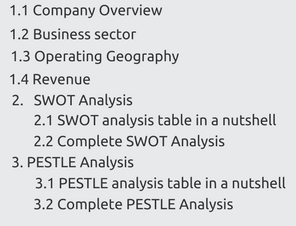 The SWOT Analysis for Bridgestone is presented below in a nut shell. 1. Stiff Competition in diversified product. 1. Solid global footprint: Bridgestone has a solid global footprint with business existing in 150 countries with more than 180 Production and Development in 26 countries. It is largest tire and rubber manufacturer in the world. It has 180 manufacturing plants globally which helps in localization. It procures some of its raw materials like synthetic & natural rubber, steel, etc. from international operating regions like Russia, US, Russia, etc. and optimizes costs. Its net sales grew by 8% in the Americas, by 13% in Russia, Africa, Europe and Middle East in 2017 as compared to 2016. The sale of tires rose because of the launch of new products and services globally and swift response to change in demand. 2. Diverse product portfolio: Its diversified product lineup includes passenger and light truck tires, motorcycle tires, commercial truck and bus tires, aircraft and mining tires, industrial products, and sports goods like premium golf balls, clubs & business solutions to capture demand in mining, fleets and agriculture through targeted packages. Many of these products are used in everyday consumption and serve various industries which make the business sustainable in long term. The strong momentum in the segment’s growth is reflected in the increase of 7% from FY2016 to ¥627.8 billion in FY2017. The group is adding more products in this segment like HosePower through acquisitions like with Industrial Rubber Co. New Jersey. This will increase its earnings as it caters to demand across more segments like Firestone with the Firestone FR500 for cars and Firestone Destination LE02 for SUVs, Dayton which is an affordable & economical tire range for small to the mid-sized cars, premium tires Blizzak LM-001 for the BMW X3, etc. 3. Leveraging R&D to strengthen innovation and increase productivity: Bridgestone is constantly developing new products for aligning its products and services with global demand. It adds sophistication and improves quality. The NanoPro Tech which uses design technology at molecular level has increased the safety and efficiency of its tires. The development of “Air Free Concept” for inflating bicycle tires without air, Smart Siphon drainage system for water supply equipment, etc. has added value to its brand. This improves productivity, increases asset value and optimizes costs. The aircraft tires are developed after broad based studies like basic polymer synthesis research, structural theory study, stress distribution analysis, vibration reduction, etc. This is seen through the increase in R&D by 4.6% in 2017 and a subsequent 6.5% growth in total assets. 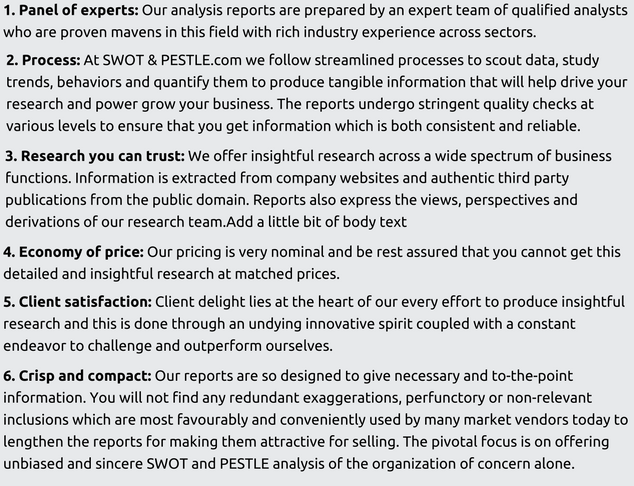 The remaining section under "Strengths" is available only in the 'Complete Report' on purchase. The PESTLE Analysis for Bridgestone is presented below in a nut shell. 1. ‘Ologic’ the fuel-efficient tire technology produces fuel efficiency. 1. US tariffs on steel to adversely affect sales: US has imposed 10 percent tariff on aluminum imports and a 25 percent tariff on steel. Bridgestone produces steel belted tires at Tennessee plants in Nashville. They will increase prices and may cut production costing $28 million because of the steel tariffs. The shift of price burden to consumer can hit demand passenger cars and trucks which in turn will lower demand for tires used. With around 78% of net sales in diversified products segment tariffs can also affect this segment. This will affect the economy growth and the opportunities for business and independent tire dealers who support free and fair trade. 2. Political stability in major operating zones: Political stability affects macro environment through government regulations on fuel prices, costs of vehicle ownership, import- export policies, etc. Political instability also interrupts raw material procurement, operations and increases price pressures due to risk of poor harvest. Bridgestone has dominant market shares in developed economies like the US, UK, Japan, etc. which are politically stable and minimizes risk of political uncertainty with respect to its peers. The group is now strategically choosing locations to minimize political uncertainty like the offshore center in Costa Rica which is considered to be the most stable country in Central America due to record of peaceful power transitions. 1. Impact of macroeconomic condition prevailing in operating zones: The business activities depend on various macroeconomic parameters like interest rate, exchange rate, demand, etc. An economic slowdown can adversely impact its sales as demand for automotive products falls. The demand for its products and services relies on the operating region’s aggregate demand trends, fuel prices and local market conditions. An adverse movement in any of these variables reduces the demand for tire replacement or slows the rate of replacement. Industrial slowdown especially in mining, manufacturing and construction reduces sales of large and ultra large road radial tires and adversely affects company’s financial position. The remaining section under "Economical" is available only in the 'Complete Report' on purchase. Continental, Goodyear, Michelin, Hankook, Pirelli, Sumitomo, Yokohama. Bridgestone, Firestone, Blizzak, Lassa, Dueler, Potenza, Ecopia, DriveGuard, Turanza. Bridgestone SWOT and PESTLE analysis has been conducted by Kanupriya Sheopuri and reviewed by senior analysts from Barakaat Consulting. 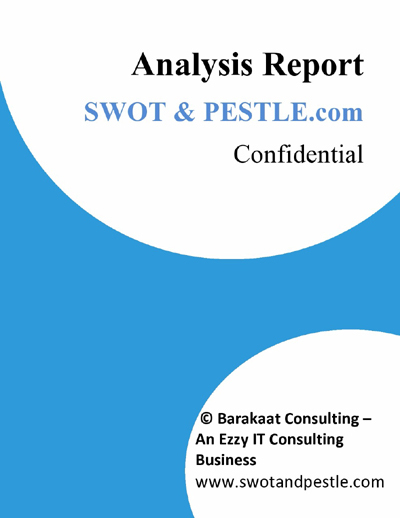 Copyright of Bridgestone SWOT and PESTLE Analysis is the property of Barakaat Consulting. Please refer to the Terms and Conditions and Disclaimer for usage guidelines.